In the next two months, over 25,000 properties across Detroit will be put up for sale in the nation's largest-ever municipal property auction. In any other city, this would be groundbreaking news but, in Detroit, it hardly budges from the status quo. For prospective buyers, auction is a low-risk opportunity for anyone with even an inkling for real estate to purchase dirt-cheap properties. For everyone else, the stakes are incredibly high: the Wayne County Treasurer needs to make as much money as possible during the auction to curtail its looming emergency management; residents of auctioned properties face the threat of eviction, and foreclosures themselves are directly linked to the destructive forces of blight that threaten the stability of the entire city. The Treasurer has begun an aggressive ad campaign on the auction for the sale of "commercial, residential and vacant land," but many details are still slow to come forward. However, dates are being set, the property listings are being issued and the answers to some of the remaining questions can be gleaned from the experiences of auctions past. The auction is composed of two rounds, which are both preceded by a registration period. Every step of the process takes place online. Registration began August 13 and will conclude September 10. The process involves entering basic personal information and payment of a non-refundable $35 registration fee. Then, registrants pay the deposit required to participate, which is $2,500 to bid a single property or $10,000 to bid on multiple properties. Once the deposit is issued, it will remain in the possession of the Wayne County Treasurer until the end of the auction. Participants can register separately for Round 2, but Round 1 registrants will be able to participate in both rounds with no additional steps. 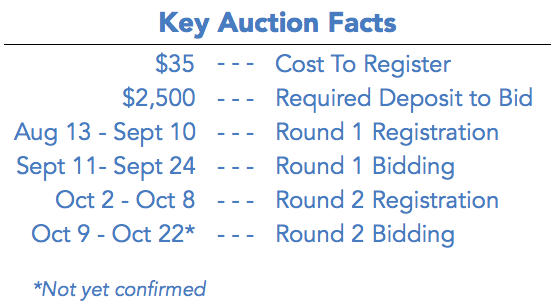 Auction Round 1 takes place September 11-24. During this time, each of property is placed up for sale for a one-week period along with its designated "batch" of approximately 100 properties. Batches have bidding periods staggered by 15 minutes. In this round, the starting bid for each property is whatever amount the property owed in back taxes so it is not directly correlated to the value of the property. Bidding goes in $100 increments up to $10,000 and then in $1,000 increments from there. If a bid is placed in the final minutes of the bidding period, the time will be extended a few additional minutes to give other bidders a chance to counter. Purchasers of auction properties must pay in full for the cost of the property within 24 hours after the bidding closes. If the highest bidder fails to pay, the subsequent bidders may find that they have the opportunity to purchase the property, after all. If the cost of the deposit exceeds the purchase price, the winning bidder will be reimbursed. A quit-claim deed will be issued to the new property owners approximately 1-2 months after the sale is complete. Only a small fraction of the properties available for sale will actually be purchased in Round 1. Most sales are of properties in centrally located areas or those whose current owners have managed to secure enough money to re-purchase them. A new law passed at the end of 2014 prohibits owners from repurchasing their own homes from tax foreclosure unless they pay an amount equal or greater than the taxes owed. For the most part though, people keep a careful eye on the properties they are interested in, hoping no one else will bid and that they will get a chance for a major bargain in Round 2. Auction Round 2 will be held during an as-yet unspecified 2-week period in October. During this time, all properties that were not sold in Round 1 of the auction will be available for sale at a starting bid of $500. The rules of Round 1 still apply in most aspects of the bidding process. There is a caveat: some properties may be "bundled" together, meaning that they will not be sold as individual properties but rather as a group. In last year's auction, over 6,000 properties were joined together in a "blight bundle" with a starting bid of $3.1 million. Bundling is not expected to affect Round 1 of the auction. There is no rule of thumb here: some properties will sell for thousands, others will sell for that minimum $500 price and many thousands will likely go un-sold altogether. Without question, the tax foreclosure auction is a significant opportunity for Detroiters and outsiders alike to become property owners in the city. However, the online auction can act like one big candy aisle where people make "impulse purchases" of real property that affect real lives. The ease of buying an auction property belies the difficulty of what comes next. Detroiters know: if it seems to good to be true, it definitely is. One of the hidden costs of purchasing a tax foreclosed home are the taxes themselves. Once a property arrives at auction, the back taxes that led to its foreclosure are wiped away, but the current year's taxes are not. This means that when auction buyers receive their deeds at the end of this year, they will already owe for 2015 property taxes, though they just purchased it and have not/will not receive a bill. Those past-due taxes will accumulate at a rate of 18% annual interest. If the owner does not pay those taxes, in just another year the property will be subject to reversion- in other words, the sale will be revoked and the property will revert back to government ownership. 18,000 properties were subject to reversion this year alone, and over half of those were purchased in the 2013 auction. Even if you find out about the taxes, you'll find that the bill is shockingly high- Detroit property taxes are high to begin with, and a factor that is compounded by chronic over-assessment of property values. While Detroit may seem to some to be a blank slate, the properties for sale are more often homes than not. In other words, a majority of auctioned properties are occupied residential houses. In years past, owners could participate in the auction to re-purchase their homes from under the crushing debt, but the passage of a recent law will prohibit most owners from taking advantage of the auction, rendering them sitting ducks. Some savvy auction buyers specifically target occupied properties for purchase because they are, presumably, in living condition whereas vacant houses are not. The news owners of occupied residential properties are faced with the moral and practical costs of dealing with those residents. Few buyers take the time to communicate with the current residents of the homes they plan to buy in advance, so the interaction often begins when the deed has already been issued. Many buyers never intended to live in their new property themselves and chose to rent or sell the property back to the residents. Both of these options come with many challenges. Many auction buyers are not professional property managers and are unprepared for the legal and practical concerns of being a landlord. Selling a property in Detroit can be extremely cumbersome, with pitfalls at every stage. Perhaps this is why many people chose to evict residents of the properties they buy. Those who follow this path are unlikely to receive "adequate" police oversight (last year, two auction buyers were murdered in a conflict that arose as they attempted to take over possession of the home they had purchased). Even if residents are evicted without issue, the home that was recently livable may quickly fall to disrepair as omnipresent scrappers take advantage of the opportunity to relieve the empty house of its appliances, wiring and other infrastructure. This is part of the reason why there is an 80% correlation between foreclosure and blight in this city. Owners should be prepared to immediately secure or occupy the property if they hope to retain it in whatever state it was when they bought it. And then, even if all goes without fail, there will remain the question of what happens to the previous occupants¬- bad juju all over your slice of the American Dream. Perhaps the most defensible way to participate in the auction is to purchase and restore an unoccupied property. New neighbors are often welcomed since vacant houses are a threat to their neighbors, bringing increased risk of fire, illegal activity, and the threat of more blight. Resuscitating a home still comes with the perils of scrapping and de-habilitation as the new owner prepares the property for occupancy. It's why HGTV celebrity Nicole Curtis has 24/7 security on her property in Detroit's up-and-coming Brush Park neighborhood. There are those who buy in hopes of flipping a property without laying a finger on it, waiting for rising tides to do the heavy lifting for them. It's not always that easy. First of all, there are the annual taxes to deal with, but more pressingly there is the aggressive nuisance abatement program being launched by local government across Detroit. Property owners are fined for all manner of offenses including un-mowed grass, legal dumping and blight. Failure to correct these transgressions (which, in some cases involved demolishing a property, a $10,000+ operation) results in legal action, which often concludes in government acquisition of the property. If you call the Detroit Land Bank Authority, the automated message prompts: "If you are calling regarding a seizure notice or a summons relating to your property, please press 1." Forces like tax foreclosure and nuisance abatement have a great deal to do with why the Detroit Land bank Authority owned an estimated 60,000 properties as of last January (almost 7% of all properties in the city), with volumes growing by the tens of thousands each year. The Wayne County Tax Foreclosure auction is a drama with many actors and many endings. Renters of may become first-time homeowners of the house they already live in, prospective small-business owners may secure a storefront for their new company, investors from New York to China may find an investment opportunity in the Detroit renaissance, a family may lose their childhood home only to have it fall to ruin. 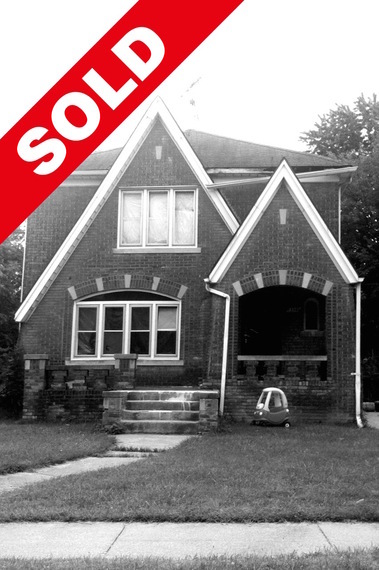 There are conscientious ways to participate in Detroit real estate in general and the auction in particular, but buyer, beware and buyer, be aware. Detroit is not a bank slate, many of these houses are homes and the same forces that have pushed 50,000 properties into tax foreclosure in the past two years will still be there when the auction block closes in October.